Mercedes have introduced a new diffuser for Suzuka which deletes one of the standout design considerations their previous one featured. Gone is the centralised 'U bend' which not only allowed access to the engines starter but also allowed airflow from the upper surface to permeate the diffusers airflow structure. 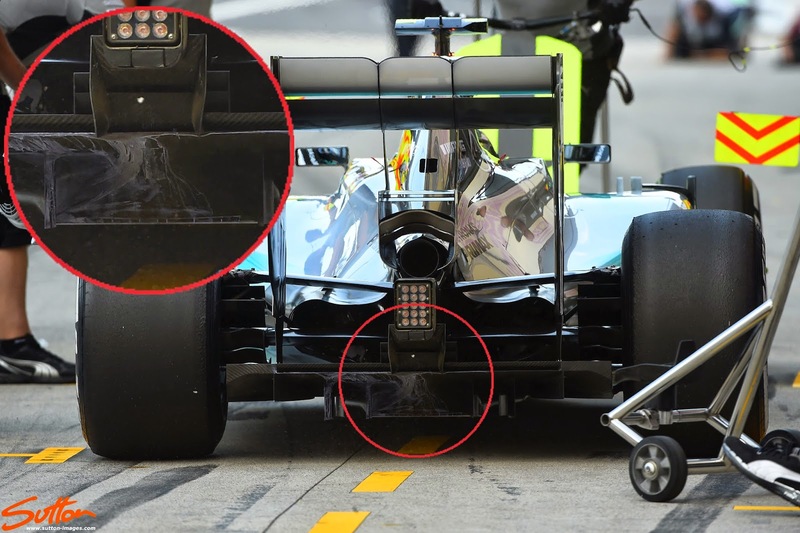 It's a design feature that has since been assimilated by McLaren but now appears to be defunct in the eyes of Mercedes. They have returned to a more conventional boat tail centre section with a hinged flap, allowing access to the starter. Furthermore you'll note the team (like many of the others on the grid) have installed a row of small vortex generators on the transition between the plank and diffuser.